To better understand the three types of assets in Steem and how they can be converted one into another, I’ve created this Steem Currency Cheat Sheet. Hopefully this can serve as a helpful reminder. I’m not an expert however, and might have gotten something wrong. So if you spot an error, or just feel like adding something, please let me know! The #steem Ponzi explained in one easy chart. Bitcoin bagholders deposit BTC to pay earlier Steem users. You sign up, you blog, you get paid. That's what most people will do. There's no financial accusation that one can launch against this. There's only gain involved. You start with zero and try to make something. Cryptoinvestments are a different animal altogether, and there is not a single cryptocurrency, BTC included, that has not been labeled a ponzi, a pyramid, etc. The deposit arrow from BTC to SP. That is not a transaction that it is possible. You can deposit BTC and buy Steem Power directly using the "Deposit" button on Steem Power in your wallet. Hunh you guys are right, I stand corrected I just checked that out. Thanks! @blocktrades lets you do it. It is possible through blocktrades, I believe. The chart should probably show that it's talking about using blocktrades. Thanks for putting this together. Very, very useful. Do you have a license in mind for it? Are others free to use it as well when they present on Steem and how it all works? well explained! Good job! I'm going to keep your post as a reference, where I can easy get back to. Good question, I don't know the answer as I never powered down yet. It is possible that your power balance is decreased right away when you power down, in which case you accumulate no "interest"
There in fact not Steem Power, but VESTS you really have on you balance. VESTS qty is fixed and you "power down" VESTS. Steem Power is dynamically risen up because VESTS rise in price vs Steem. That's a good explanation but then how do i increase my vests? True (embarrassing) story. When I tried to convert some of my BTC for Steem a week or so back, I thought you had to get Steem at an exchange first to do so. When fumbling around on my wallet with how to get Steem in, and only then, did I carefully read each of the other drop down menus. You mean I could have just sent it here in the first place?!?? So yeah, this tutorial is awesome. Totally bookmarking as a necessary read for newbies....and I. Well, don't feel embarrassed about that. The exchange might well have had better rate than the built-in option. Convenience often comes at a price, doesn't it? Very true on paying for convenience, ie convenience store vs grocery store for food or drink. This is wery usefull. Ewerybody should know this. This should be linked to the main page of wallet, so ewerybody could read it, insted of always asking and wondering. This was great made @peterz keep upp the good work. So clever... they've created a market for themselves consisting of cash, stock, and bonds, without ever going through the SEC. Nice compilation of info. So SD is like t bill whereas Steam power behaves like short term bond. Can you clarify further on the purpose of steem since it depreciates in Value? Especially when SD can be transfer around so there is really no need for steem right? Good question! I think I'll need to consult the white paper before I can answer. From top of my head, I think STEEM may provide flexibility needed to maintain all the invariants ($1 per SBD and the author/curator rewards). This seems like a theory from Macro economics. A stable exchange rate would mean no free capital movement and independent monetary policy. If there is freedom of capital movement and independent monetary policy then there will natural fluctuation of exchange rate as per determined by market force. 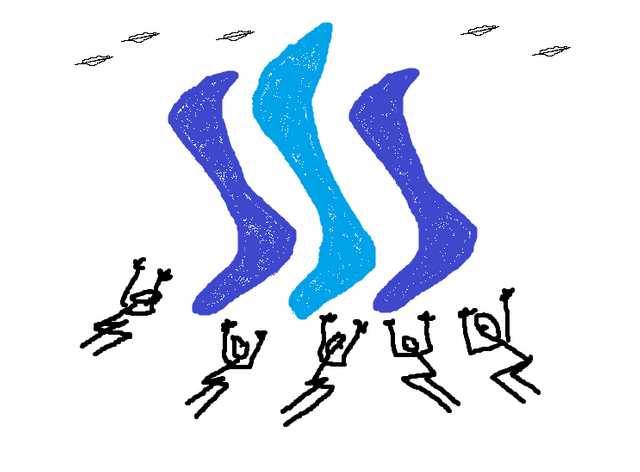 Developer of #Steemit can manage exchange rate by limiting the supply of Steem payout. This is one example of no free capital movement and an independent monetary policy. 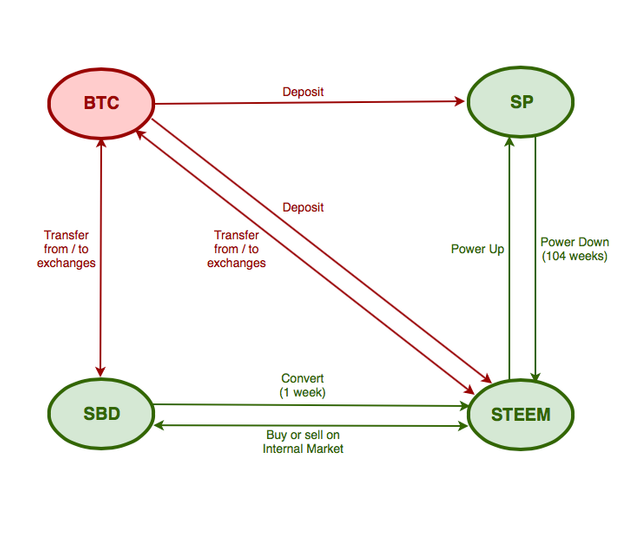 However I do not understand that since no monetary tools are available apart from managing supply/ demand, Steem developer cannot increase nor depreciates the exchange rate through managing the interest rate since Steem power and Steem dollar interest rates are sort of fixed. Anyone have an idea on this? And what are the tools that Steemit developer can use to manage and maintain a stable exchange rate? You forgot to include ether which you can deposit to power up. But really they've sorta brought it on themselves. Crypto, like I've heard (and experienced) over the last 20 years said about the stock market, can be a very cruel mistress. This is freakin awesome for us newbies to Steem and the whole crypto world like myself. One thing I still am confused about is, how exactly can any of this actually be turned into and actual USD payout? Maybe add that to this graph as well? At this point by the little I know and understand the only way this can be done is turning your steem into bitcoins than bitcoins into USD? Is this correct? Personally I want to invest into the long term Steem option, but like myself and others new to the "game" might want to know exactly how this is done. Is there a future plan maybe where steem could actually be converted into USD directly??? Thanks to anyone who can answer this! I believe STEEM -> BTC -> USD is the most used option. Some steemians might be willing to buy your STEEM for USD from you, I believe I have seen posts here offering such a service. But of course you'll need to trust them. I laid out how (and some theory as to why) I invested in STEEM here. It is a personal decision though which you need to make yourself; I cannot make a recommendation for others. Hey, congratulations. It seems you got to the TOP 10 Trending posts on Steemit today so your post has been added to the Flipboard Steemit Trending Magazine for everyone to see it. Excellent guide, many users are confused about the different token, I hope it will help them. not quite right with SBD. You cannot transfer SBD into your account or transfer BTC in to buy SBD directly. You can go from Exchange/BTC -> STEEM -> SBD internally, though. Right? You can buy SBD for BTC on an exchange. Then, I've never done that, but I presume you should be able to transfer those SBD to your account -- just like any other cryptocurrency. Did anyone try that? there is no deposit method for SBD. Actually, there isn't one for STEEM either. You'll notice that "deposit" for STEEM is in BTC (which then they presumably use to buy STEEM on their internal exchange). Thank you I needed this visual explanation. Could you elaborate on the influence of steem power? If I upvote with 1 steem power in my account, what does this equate to in terms of reward for content creator? 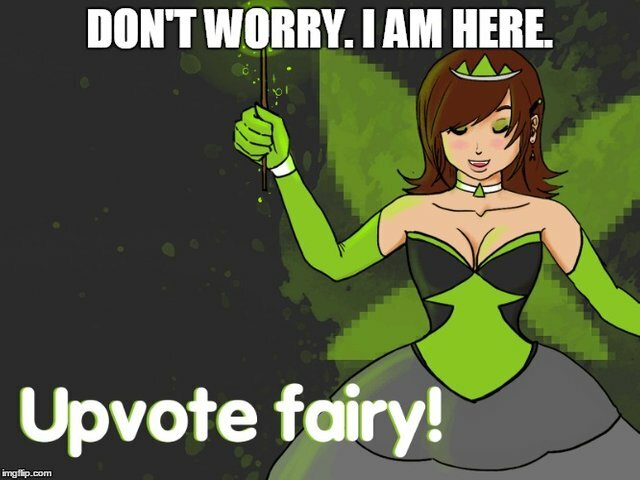 Is my upvote worth 1 Steem? 10 steem? How does the math work? I asked this in a recent post but didn't get a response. I agree. There doesn't seem to be much about the calculation. Let the trending goes on and on hahaha! Each 3.3 years, a 10:1 reverse split occurs. 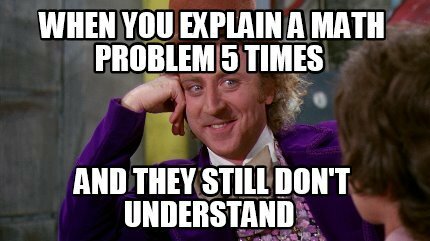 Can you explain why is that? In order to compensate for the ever increasing precision, the STEEM network performs a 10:1 “reverse split” every 32,000,000 blocks (about 3 years). At this point in time all balances of STEEM are divided by 10 and all prices are multiplied by 10. Cryptocurrency exchanges will have to suspend trading around this time and update the account balances and price history to reflect the “reverse split” before resuming trading. The "ever increasing precision" thing means that as new STEEM is minted, the total number of tokens will eventually exceed the maximum number a modern 64-bit computer can represent. Without the split, token supply would increase 1000 times in 10 years. Great explanation, I didn't previously understand the bond analogy for the steem backed dollars, your article and diagram made it crystal clear. Very Helpful thank you a lot ! my Steem Power to convert to Steem need 104 weeks? only this?? Awesome Peterz, QUESTION: Would you happen to know how your SP voting power is affected once you action the Power Down option? Listening to World Crypto Network yesterday and it sounded like one of the very informative members was saying you loose all your voting power onced powered down? I may have misunderstood. I would think you only loose the power to 1% that comes out every 7 days. Cheers and great post. getting 5000 dollars writing things that were already known??? Unbelievable! As a n00b, is there a ressource anywhere that indicates what is the relative value of those currencies against one another? I understand the Steem-backed dollars are pegged against the USD, but I'm wondering where to find the recent SBD/STEEM and STEEM/SP ratios? Great to have clarity on this! Curious to see how the platform matures with the rise of cryptocurrency. Thank you! One question I have is how is Steem, or SBD actually converted to BTC? Is it something availble through our wallets or do we have to go through some sort of intermediary. I apologize if this is a novice question but I cannot see the method of transfer. this detailed explanation is remarkable! Good explanation of the ecosystem. thank you for creating this cheat sheet its been most helpful! STEEM still has much room to grow in terms of value. In your wallet, instead of pressing the convert to STEEM, you can press "Buy or Sell" . you can enter that you want to buy STEEM. I had never heard of it as the internal market before (I should have clicked on the link). BTW, This is a very clear guide. I find it very useful. This is a huge help for us new to Steem, thank you for posting! I just received my first payout and was trying to figure out how to convert steem dollars to SP without waiting a week. Now I know I can convert to bitcoin via an exchange and deposit back as SP today... if I understand that correctly?? Thanks for your guide! Very clear figure! it's curious that will call inflation the increase of monetary base. In reality Steem value is going to probably increase a lot in the future, and there won't be inflation until Steem becomes the most used currency in the world.